I am re-posting the timeline I originally posted on April 20 with updates. I will continue to update the timeline, but will not re-post it. The updated timeline can be easily accessed from the link under "Kurdish Timeline" on the right-hand sidebar. In 2009, the phrase of the moment was “road map” -- whether in the TESEV report [click here] or Öcalan’s shelved opus. Deniz Baykal invoked the phrase sardonically to distance his party from the Kurdish opening, bidding the AKP, “Bon voyage!” The problem, though, is that the Turkish government appears to have been without a road map. Its journey has accordingly seemed meandering, its leaders driving blind. A slightly different metaphor, however, of peace as a process, does seem to describe events as they have transpired. Erdoğan might still be prevaricating when he claims the “democratic opening” is a seven-year work in progress with short-, medium- and long-term objectives. But this concept does offer some hope, a glass with something in it, even if it is far from half-full. And Erdoğan is not wrong to emphasize how much progress has been made. The politics of pushing throuh the initiative, especially an amnesty for former PKK militants, is no easy task, and especially at a time when the AKP is embattled in efforts to amend the constitution. Understandably, with the CHP now red-hot over judicial reform, the AKP does not want to offend nationalist voters and gain the wrath of the MHP, a party with which the AKP heavily competes for votes in conservative Anatolia. Yet, the AKP has plenty of room to save itself and re-ignite the process. If the Kurdish nationalist Peace and Democracy Part (BDP) can be properly engaged and the process yield results in terms of decreasing terrorist attacks and reinvigorating enthusiasm lost in October, the popular enthusiasm for the government's initiative recorded in polls last summer might also be rejuvenated. The road is not easy. The Foundation for Political, Economic, and Social Research (SETA)'s Hatem Ete, back in August, wrote that the AKP's task at hand involves the government involving all parties in the initiative, from the ultra-nationalist MHP to the BDP, and that as daunting a feat as this is, that should the AKP be able to get state institutions involved, most importantly the Turkish Armed Forces (TSK), the initiative might just yield results. While Ete rejects any form of mediated talks with the PKK, he does acknowledge an important role for Kurdish nationalist politicans to play. With the looming threat of increased violence and yet indications from imprisoned PKK former leader Abdullah Ocalan that he is willing to allow for more distance between the PKK and the BDP, engagement is indeed possible at this time and will prove essential to successful reform efforts in the future. Ongoing operations against suspected members of the Kurdistan Democratic Confederation (Koma Civaken Kurdistan - KCK), a group functioning as go-between for the PKK and the BDP, have badly damaged relations and, as Huseyin Yayman explains, only served to consolidate support for the PKK by leding creedence to their rhetoric of "elimination." Bridges burnt between the AKP and the BDP in recent months can be rebuilt, but only with diligent, sustained effort and willignness on the part of the AKP to engage in dialogue to begin with -- something the party did not seem keen to do even at the earliest stages of the initiative. The AKP's initiative is not the first significant gesture a Turkish government has made in regard to the Kurdish problem, but it could be the first to succeed. In 1991, Prime Minister Suleyman Demirel boldly declared, "Turkey has recongized the Kurdish problem," and before then, President Turgut Ozal had been holding secret negotiations with the PKK throgh indirect contacts. In 1993, despite the ocnflcit's later escalation, Prime Minister Tansu Ciller spoke of the Kurdish conflcit as parallel to Spain's conflict with the Basques, suggesting that a limited autonomy solution might be possible. (In November 2008, the same was suggested by then Turkey-EU Joint Parliamentary Commission co-chairman Joost Lagendijk.) And, in 1999, after the Helsinki Summit, Mesut Yilmaz instructed, "The road to the European Union passes through Diyarbakir." The ending of the unilateral PKK ceasefire in 2004 and rising Turkish nationalism has since complicated the journey, but it is not too late to forge onward. However, as Lagendijk informed at the end of his tenure, the path taken must first be chosen by Turkey. Erosion of support for the EU accession process and skepticism about the wave of trips the EU paid to the southeast in the first years of the accession have soured the efficacy of the EU in the process while the United States' role is beleaguered by its role in Iraq and widespread accusations of its having imperial designs. (Notably, in recent months, Ocalan has sent signals that he is now more willing to deal positively with the EU.) And, there is drive in Turkey t do, however dissipated it might be in this moment. In a recent op/ed response to an argument that the BDP has not changed while the government has, Radikal columnist Oral Calislar writes that Kurdish nationalism is a fact that must be dealt with, and that, in fact, both Kurdish nationalists and the government have changed. This, indeed, is a product of the peace process, and it leaves much hope to be had. Several Turks realize that the formation of the Kurdish Regional Govoernment (KRG) changes the name of the game, and that the continued polarization and relative deprivation of Kurdish nationalists in Turkey could have profound effects in the future if the issue is not solved in the soon to near future (for examples in English, see these op/eds by Omer Taspinar and Cengiz Aktar; for a taste of recent nationalist rhetoric, see AFP's interview with BDP deputy chairwoman Meral Danis Bestas). Recognizing the Kurdish problem to be his problem, Prime Minister Erdogan made a bold first step when he addressed an audience in Diyarbakir in 2005, and recognizing"Kurdish nationalism" will be another big step yet. But, this is what a peace process is all about. The government was never going to solve the Kurdish problem in one fell swoop, but the initiative was, and should it be re-energized, a step in the right direction. Below is a timeline I have assembled documenting developments in the 'Kurdish opening' from February 2009 to last week's attack on Ahmet Turk. I would more than appreciate any additions of important events/details I have left out. For events before February 2008, see my post, "Beyond Bananas: Hopes for the Kurdish Minority in 2009," Jan. 8, 2009, in addition to this article by the European Stability Initative's Ekrem Eddy Guzeldere that appeared in Turkish Policy Quarterly. 2/15 -- Protestors marking the tenth anniversary of Abdullah Ocalan's capture clash with police throughout the southeast. 2/22 -- Prime Minister Erdogan visits Diyarbakir to launch TRT-6 under threats from the PKK. Despite the government's efforts to seell the station in the southeast, the new channel is largely seen as an election ploy. The DTP does not support the channel, largely seeing it as a superficial attempt by the AKP to undermine its clout before elections. 2/24 -- DTP leader Ahmet Turk, observing UNESCO World Language Week, illegally speaks Kurdish in parliament to the outrage of nationalist politicians. Turkish national television immediately cuts off feed. 2/27 -- Turkish Armed Forces (TSK) Chief of General Staff Ilker Basbug expresses support for limited cultural rights. The PKK declares a unilateral ceasefire. 3/9 -- Iraq President Jalal Talabani calls on the PKK to lay down its arms following a bilateral meeting in Anakra with President Gul and Prime Minister Erdogan. Kurdish Regional Government (KRG). President Massoud Barzani supported Talabani's call much to the betrayal of some Kuridish nationalists in Turkey. 3/10 -- President Gul, talking to reporters in Tehran, sends the first signal of what would become known as the 'Kurdish Opening,' declaring, "There are already good things happening. We are resolving our own internal problems." 3/23 -- Prime Minister Erdogan visits the KRG to urge cross-border cooperation in stopping PKK attacks incursions into Turkey. It was the first time a Turkish leader had visited the region in more than 30 years. Newroz celebrations result in few incidents of violence and the expected calls for the state to negotiate with the imprisoned Ocalan and the PKK. Ocalan calls on followers to resist KRG-led resolution efforts, harshly criticizing KRG President Massoud Barzani and telling followrs to stay away from a planned summit Barzani was reported to be planning in Arbil. The Arbil summit never came to fruition. Leyla Zana denounces the calls of KRG politicians for the PKK to lay down arms, echoing Ocalan's call to stay away from the planned summit in Arbil. United States involvement is also denounced. 3/29 -- In municipal elections, the DTP wins landslide victories across the southeast, losing many districts in which the AKP had done well in 2004. Academic and member of Turkey's PEace Assembly told Bianet before the election that "it's a referendum on if the PKK-DTP line should be regarded as the main address for a dialogue to solve the Kurdish issue or not. . . . The state and the government are trying to avoid that and hope to render conservative Kurds as their counterpart. I believe that DTP, which claims to be the main actor, will gain strength in the elections." 4/20 -- Over 120 suspected members of Kurdistan Democratic Confederation (Koma Civaken Kurdistan - KCK), a group functioning as go-between for the PKK and the DTP, are detained, including senior members of the DTP. The arrests are widely seen by Kurdish nationalists as a response to the DTP's March electoral victories. The detentions and arrests that follow will be the first in a series of operations against the KCK. These are still underway. 4/27 -- An extensive police operation in Istanbul against a leftist organization linked to the PKK results in a five-hour shootout in which three police officers are killed. The militant on the other end of the gunfight, Orhan Yilmazkaya, turns out to be 0ne of the top three leaders of the Revolutionary Headquarters. 4/29 -- 10 soldiers are killed in Diyarbakir and Hakkari provinces in violation of the PKK's unilateral ceasefire. 5/13 -- Ocalan announces plans to release a roadmap for peace, later issuing a statement through his attorneys that the roadmap would be relased on Aug. 15. Though the roadmap was never released, stories about its would-be content continue to be published in Turkish newspapers through the summer, including in a much talked about government-sanctioned interview with Ocalan conducted by Hurriyet journalist Ertegrul Ozkok. Details included a wiseman commission to mediate an amnesty between the Turkish state and the PKK. Ocalan informs that any mediation should be done without participation from the United States or European Union. Ocalan's roadmap, as it was part and parcel revealed, also resembled the vague four-point plan the DTP would later float around. PKK Commander Murat Karayilan, in an April interview with Milliyet's Hasan Cemal, laid out similar plans (see also Jenny White's post, including a link to the interview in Turkish). 5/18 -- President Gul says Turkey has a "historic opportunity" to solve the Kurdish question. 5/22 -- In a speech in Duzce, Prime Minister Erdogan argues that Turkey should begin fairly dealing with its minorites. From the speech: "Over many years, suspicions toward foreigners existed in this country. This mindset has seemingly not changed. They have chased members of various ethnic groups out of this country. Have we won? We should think about this. Actually, this was a result of a fascist mentality." 5/26 -- A mine explodes in Diyarbakir province killing six Turkish soldiers in violation of a unilateral PKK ceasefire in effect since March. 5/31 -- The PKK extends its ceasefire to July 15 in anticipation of Ocalan's roadmap. 6/13 -- A Turkish soldier and a PKK militant are killed in a firefight exchanged at the Turkish border. 7/15 -- The PKK extends its unilateral ceasefire to Sept. 1. 7/22 -- Prime Minister Erdogan announces that the government is preparing its own comprehensive plan for peace. Soon after, AKP deputies appear for the first time in six years on Roj-TV and state that “all political actors [including Ocalan] should be considered if they positively contribute to the peace process." Interior Minister Besir Atalay gives a televised press conferece. From the conference: "We have the intention to take determined, patient and courageous steps." MHP leader Devlet Bahceli and other ultranationalist leaders vociferously denounce the plan while some PKK opinion leaders welcome it, hoping that it might lead to dialogue between the government and the PKK. 7/29 -- Leaders from Turkey, Iraq, and the United States meet in Ankara to discuss how to deal with the PKK in the context of a tripartite mechanism setup between the countries to arrange for cooperation between them on the issue. 8/1 -- CHP Deputy Chairman Yılmaz Ates joins a show on pro-PKK Roj-TV, stating that “we need to have self-criticism about what happened that we [Turks and Kurds] have become foes.” Divisions seem to emerge within the CHP as to how to approach the government's intiative. 8/3 -- The Turkish National Police Academy hosts Interior Minister Besir Atalay and a group of opinion leaders to discuss the Kurdish question. The workshop, titled “The Solution to the Kurdish Question: Toward the Turkish Model,” was attended by 15 participants, all warm to the government's plans. "The DTP's Deputy-Chairman Selehattin Demirtas, list[s] four demands as the basis for any peace settlement including: forming a new constitution that fully supports democracy; amending article 66 of the constitution, which defines a Turkish citizen as anyone 'bound to the Turkish state through the bond of citizenship is a Turk, in order to emphasize the non-ethnic qualification for citizenship; removing the ban on using the Kurdish language in education and media and empowering the local municipalities'" (Emrullah Uslu, Eurasia Daily Monitor, Aug. 14, 2009). 8/20 -- Ocalan delivers his 160-page handwritten roadmap to his attorneys whereupon it is confiscated by prison officials at Imrali. 8/25 -- The Turkish Armed Forces (TSK) General Staff express support for the government's plan to grant limited cultural rights and improve economic development in the southeast. However, the TSK drew red lines on negotiating with the PKK, undermining the unitary structure of the Turkish state, or making Kurdish an official language. The end of August proved to be a turning point. First, harsh criticism of the AKP poured forth from the parliamentary opposition, replete with dire warnings of the impending downfall of the republic. This invective was followed by a message from the chief of general staff, İlker Başbuğ, posted on the army’s website, which reiterated the military’s commitment to the “unitary” Turkish state and the struggle against terrorism. The top general rebuffed the DTP call upon the government to negotiate with Öcalan, saying, “There should be a good look at who is responsible for the bloodshed. You cannot put martyrs who sacrificed their souls for their country and terrorists in the same corner.” In response to the push for political and cultural autonomy for Kurds, Başbuğ continued, “The state of Turkey, the country and the nation, is an indivisible whole. Its language is Turkish” (Marlies Casier, Andy Hilton and Joost Jongerden, “'Road Maps' and Roadblocks in Turkey’s Southeast," MERIP, Oct. 30, 2009). 9/2 -- Prime Minister Erdoğan, attending an iftar meal (to break the daily Ramadan fast) with police at a Special Operations Department branch, declare[s], “I say this very clearly and openly: Neither the state nor the government of the Republic of Turkey will sit down with terrorists or treat a terrorist organization as a party to negotiations. This can never, ever be a subject for discussion” (Marlies Casier, Andy Hilton and Joost Jongerden, “'Road Maps' and Roadblocks in Turkey’s Southeast," MERIP, Oct. 30, 2009). 9/10 -- The Higher Education Council (YOK) gives Artkulu University in Mardin the permission to teach Kurdish language education courses. The language was offered alongside Farsi, Arabic and Syriac at a new "Living Languages in Turkey" institute. YOK Chair Yusuf Ziya Ozcan, announced that language courses would train academics to teach minority languages. A similar initiative at Dicle University in Diyarbakir for teaching courses only in Kurdish under the heaidng of a "Kurdish" faculty was rejected. 9/14 -- The Turkish Armed Forces (TSK) apply to the parliament to prolong its mandate to conduct military operations in northern Iraq. 9/23 -- Turkish Armed Forces (TSK) Chief of General Staff Ilker Basbug once again expresses cautious, but heavily guarded support for the government's intiiative. For coverage from Bianet, click here. 9/23 -- The PKK issues a press statement criticizing the "Kuridsh opening" for not recognizing Ocalan as a negotiating figure and not suspending anti-PKK military and police operations. DTP members argue the government's initiative presents old policies in a new package. 10/8 -- After refusing to meet with Interior Minister Besir Atalay, CHP leader Deniz Baykal sends a letter to Prime Minister Erdogan agreeing to meet with the prime minister. Deputy Prime Minister Bulent Arinc said the government might be forced to hold a referendum on some elements in the "Kurdish Opening," of which the details had still not been disclosed. 10/19 -- At the request of Ocalan, 26 refugees from the Makhmour UN refugee camp in northern Iraq and eight former PKK members cross into Turkey at the Habur Gate as a "peace group." Though the eight former PKK members were detained at the border, they were released within 24 hours. The next day, prosecutors brought charges against five of the former guerillas, but the important thing is that they were not detained, the government citing that they had not committed crimes during their times with the organization. 10/28 -- Fifteen NGOs in Diyarbakir issue a press statement criticizing the DTP for not playing a more constructive role in the "Kurdish opening." 11/12 -- Interior Minister Besir Atalay announces a six-point action plan. An amnesty is not included in the plan. 11/13 -- The AKP introduces part of its "Kurdish Opening" in parliament. The legislation includes the easing of restrictions on private Kurdish-language television stations and Kurdish language faculties in universities, as well allowing towns and villages to use their original Kurdish names once again. The party leadership decided on individuals who will have the authority to make statements for the party and the government in the initiative process. These individuals are Prime Minister Erdoğan, Interior Minister Beşir Atalay, Foreign Minister Ahmet Davutoğlu, Deputy Prime Minister Cemil Çiçek, Chief EU negotiator Egemen Bağış, deputy chairmen of the AK Party Hüseyin Çelik, Salih Kapusuz and Ömer Çelik; and deputy chairmen of the AK Party’s parliamentary group Bekir Bozdağ and Suat Kılıç. According to the new strategy, nobody except these individuals has the authority to make statements on the initiative. AK Party deputies were again given the red lines that are never to be crossed when implementing reforms to actualize the democratic initiatives. Every move has to comply with the first three articles of the Constitution. According to this, Turkey’s unitary structure, flag and official language will not be changed. 11/22 -- A DTP-organized convoy touring Izmir is attacked by Turkish nationalist youth. Protests broke out in Hakarri after the attack. 11/25 -- Ocalan complains to his attorneys after he is moved to new prison facilities and his isolation ended. However, Ocalan sends messages through his attoneys that the new prison facilities are worse than before. The government had invited the the European Committee for the Prevention of Torture (CPT) to tour the new facilities and meet with Ocalan and other inmates. A protest in Diyarbakir draws five thousand people, all answering the DTP’s call to protest Ocalan’s prison conditions. 11/26 -- In Bamaric, in Canakkale province, a clash between Kurdish and Turkish youth incites widespread violence against Bamaric's Kurdish minority. Three Kurdish teenagers are jailed, and a lynch mob of thousands gathers outside where they are being held. 11/29 -- A group of PKK supporters in Diyarbakir launches Molotov cocktails at the offices of Sura-Der, a pro-Hizbullah association. In response, a thousand Hizbullah supporters assemble to protest the PKK. 11/30 -- The "peace group" that returned in October issue a statement on Ocalan's prison conditions in a press release made by the Diyarbakir Branch of the Human Rights Association (IHD). The statement is now being used in a case against them being pursued by prosecutors in Diyarbakir. For more on the case, see Bianet. 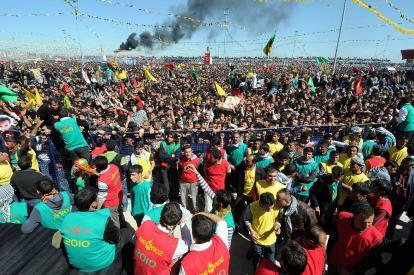 12/6-7 -- Weekend protests of Ocalan's prisons conditions draw thousands, and include more violent clashes with police. A 23-year-old university student is killed by a bullet in the back. 12/7 -- A PKK attack in Tokat kills seven Turkish soldiers. Three soldiers are wonded in a separate attack on a military vehicle. 12/7 -- The DTP's Emine Ayna gives a controversial interview (in Turkish) to Radikal in which she says the PKK gave the DTP the political space to do politics. She further goes onto say that no one should expect the DTP to deny or back away from this fact, adding that Kurds can always "go to the mountains," a metaphor for joining the PKK. Unsurprisingly, there is now a lawsuit being pursued in relation to the interview. Ayna has used the interview for her own political gain and remains in parliament while DTP doves Ahmet Turk and Aysel Tugluk are banned from politics. 12/8 -- The Constitutional Court begins to hear arguments in the DTP closure case. 12/11 -- The Constitutional court announces its decision to close the DTP and ban 38 DTP politicians from politics for a period of five years, including chairmen Ahmet Turk and Aysel Tugluk. Dramatic protests and clashes with police follow. See Dec. 20 post. 12/15 -- Shop owner Turan Bilen, whose store was attacked and car set on fire during protests of DTP's closure in Bulanik (Mus province) , opens fire on demonstrators, killing two and injuring seven. 12/23-24 -- To purportedly end allegedly KCK-organized street violence, police raid various addresses and arrest approximately 100 alleged KCK members, including human rights activists, politicians, students and ten mayors. For a list of some of those detained, including Diyarbakir Human Rights Association Chairman Muharrem Erbey, click here. For more on Erbey and a bit of insight into the operations, see this brief from Human Rights Watch. A petition followed the arrests. The so-called 'KCK operations' started in April following the DTP's sweeping election victories, prompting charges that the state/government are using the operations to target the party. The National Security Council (MGK) announces full support of the government's Kurdish initiative and announces plans to publish a roadmap of its own in 2010. The roadmap has not yet been published. Rumors persist that Interior Minister Besir Atalay will be removed from his charge of coordinating the initiative. 12/28 -- An additional 24 alleged KCK affiliates are detained in Batman and Van. 12/30 -- Ahmet Turk's granddaughter, Ruken Turk, is sentenced to 10 years in prison for attending a pro-PKK demonstration. 12/31 -- DTP's closure and the 5-year political bans of DTP parliamentarians Ahmet Turk and Aysel Tugluk go into effect upon publication in the Official Gazette. Turk and Tugluk's parliamentary immunity is terminated. Without Turk and Tugluk, and following a call from Ocalan, the remaining representatives of the DTP have decided to stay in parliament, joining the Peace and Democracy Party (BDP), which was strategically formed shortly after the closure case was opened against DTP in November 2007 as a fallback should the DTP be closed. Independent deputy Ufak Uras had agreed to also join the party, giving the party the 20 required members it needs to form a parliamentary group and be represented in parliament. 1/10 -- Foreign Minister Ahmet Davutoglu makes a tour of Mardin in support of the Kurdish opening. 1/10-11 -- Police detain two of the PKK returnees who crossed into Turkey as part of the Oct. 19 "peace group." 1/15 -- Atalay holds a press conference in attempt to reignite enthusiasm for the Kurdish opening. 1/15 -- Radio Ses in Mersin begins broadcasting in Kurmanci, Zaza, and Arabic. According to Bianet, "Radio Ses ('Voice') airs four programs in the Kurdish Kırmançi dialect, one in the Zaza language spoken by the Zaza people in eastern Anatolia and one broadcast in Arabic per week. 1/19 -- Former DTP member Hasip Kaplan announces that he has applied to the Europpean Court of Human Rights (ECHR) , arguing the Constitutional Court's decision to close the DTP violates the European Convention on Human Rights and Fundamental Freedoms. 1/22 -- Gendarmerie forces detain approximately 60 alleged KCK members, including Igdir mayor Mehmet Nuri Gunes. Protests in Igdir are to follow. 1/24 -- Approximately 60 people are detained in another KCK sweep. 400 people are involved in clashes with police during a demonstration in Dogubeyazit. 1/24 -- The Kurdistan Freedom Falcons (Teyrebazen Azadiya Kurdistan -- TAK) issues a new declaration, in which TAK threatens to hit economic targets and civilians who play critical roles in maintaining the existing political system. TAK further warns tourists not to come to Turkey, and criticizes the PKK for being too passive in its struggle against the state. 1/25 -- Conflict erupts in Igdır between pro-Kurdish demonstrators and police following a DTP demonstration. Shops mostly belonging to ethnic Azeris are stoned during the course of events, provoking violent reactions from Turkish ultranationalists. 1/26 -- A delegation from the CPT visits Ocalan's facilities at Imrali and interview him and other prisonmates. Click here for coverage from Bianet. 2/1 -- The BDP elects leaders Selahattin Demirtas and Gultan Kisanak as its co-chairs at its first party congress. 2/2 -- The day following the BDP's first party congress, the Chief Public Prosecutor's Office in Ankara opens an investigation of the party. The investigation is launched on alleged crimes of “turning people against the military,” “contradicting the Political Parties Act” and “praising crime and criminals,” according to the Anatolia News Agency. 2/3 -- PKK Commander Murat Karayilan releases his own roadmap for a future peace agreement between the state and the PKK. 2/3 -- Police detain 16 former DTP members. 2/3-4 -- The EU-Turkey Civil Commission (EUTCC) hosts its sixth international conference on the Kurdish question. another interview, Demirtaş thanked Öcalan for letting his party develop its own policies separate from the PKK. Based on this information, one can assume that the pro-Öcalan Kurds are pursuing a double-sided strategy. The BDP, of course, under the direction of Öcalan, is pursuing policies more independent of the PKK. The PKK, on the other hand, plans to pursue its own policies through a more violent terror campaign. In an interview, Cemil Bayık revealed the PKK’s 2010 strategy to remove the Justice and Development Party (AKP) from the Kurdish region. According to Bayık, the Turkish state thinks the AKP is the last resort for it to establish relations with Kurdish communities. If the PKK removes the AKP from the region, Bayık thinks, the Turkish state will have no choice but to sit down with the PKK and negotiate peace. Unlike its traditional strategy, the PKK this time will use proxies to terrorize society. The Kurdistan Freedom Falcons (TAK), an offshoot PKK organization that terrorized the country, especially tourist destinations and metropolises, in 2006 and 2007, will be the proxy organization for the PKK in 2010. The reason why I underline the TAK’s role is because this mysterious organization has recently issued a declaration threatening to resume its intense terror campaign in 2010. 2/6 -- Today's Zaman reports on Interior Ministry plans to restructure the village guard system in line with a report prepared by the parliament's human rights commission issued following the Bilge massacre. However, to date, no concrete measure has been taken. The Council of Europe has long called for the system's abolishment. 2/8 -- Unidentified individuals in an automobile open fire on BDP headquarters in Ankara. Interior Minister Besir Atalay calls BDP leader Selahattin Demirtas, describing the act as a "provocation" and conveying the AKP's concern over the incident. 2/9 -- Rojda, Turkey's most popular Kurdish female singer, is arrested on charges of "spreading propaganda for an illegal organization." More than one month later, Rojda is convicted and sentenced to one year and eight months in prison after she had been invited to attend a meeting of artists Prime Minister Erdogan had assembled to discuss the Kurdish opening. 2/9 -- More than 90 civil society organizations, including business associations, chambers, professional unions, human rights activists and women's organizations, launch the “two minutes of darkness” protest, which will run through the month. 2/11 -- The first hearing in Ankara occurs in a case involving two off-duty police officers who shot to death a Kurdish man following a confrontation in a bar triggered by the man singing songs in Kurdish. 2/13 -- Police detain another 69 people in an effort purported to assuage expected demonstrations marking the eleventh anniversary of Ocalan's capture. More detentions and arrests occur the next day. According to Bianet, more than 100 people are arrested over the weekend, mostly members of the BDP. 2/15 -- Demonstrations marking the eleventh anniverary of Ocalan's capture draw clashes with police. From Bianet: "According to Fırat News Agency, 25 people got injured in the demonstrations, 21 people were taken into detention, 17 of them children. Overall, 110 demonstrators were arrested including 35 children." 2/19 -- A trial of 61 alleged members of the KCK gets underway in Diyarbakir. 2/20 -- Prime Minister Erdogan hosts popular artists to discuss the Kurdish opening in an effort to garner popular support. 2/22 -- In one of the many cases brought against her, Aysel Tugluk is acquitted of charges of "spreading propaganda for a terror organization." Tugluk was tried together with two of Ocalan's lawyers, Irfan Dundar and Fırat Aydinkaya, who received sentences of 10 months each. 2/23 -- At an event organized by the Civil Society Development Center (STGM), Kurdish civil society leaders expressed frustration at not having their voices adequately heard by the governmnet. Today's Zaman quotes Levent Korkut: “It will be difficult for the democratization process to move on if dialogue and cooperation between civil society and the state is not ensured." 2/24 -- Mehmet Ali Aydin, head of Diyarbakir's BDP branch, is formally arrested after showing up for a morning court proceeding. 2/26 -- Van BDP deputy Fatma Kurtulan submits a motion to parliament to open an investigation into the death of former president Turgut Ozal. 2/26 -- Italy arrests 11 suspected PKK members. Dutch authorities apprehend the PKK's lead operator in the Netherlands. And, on the same day, a German court lifts the gag on Roj-TV, which had been in pace since 2008. 3/2 -- France arrests nine Turkish citizens suspected of recruiting for the PKK. 3/4 -- Belgium detains 30 people for suspected links to the outlawed Kurdistan Workers' Party, or PKK, after conducting raids on 25 locations, including a studio of Roj-TV. Nine were arrested, including Kongra-Gel (PKK) Chairman Remzi Kartal and executive Zübeyir Aydar. 3/7 -- CHP parliamentary group deputy chairman Kemal Kilicdaroglu hints that the CHP would support a general amnesty, only to back away from his comments the following week under presumed pressure from his party. The remarks triggered a strong reaction in the Turkish press. 3/7 -- Commemorating International Women's Day, in a speech delivered in Urfa Prime Minister Erdogan called on all women to contribute to the government’s efforts to end the terror problem. 3/15 -- Massoud Barzani, the president of the Kurdistan regional administration in northern Iraq, met with Aydın Selcen, Turkey’s first consul general in Arbil, the de facto capital of the semi-autonomous region. 3/15 -- Turkish Armed Forces Chief of General Staff Ilker Basbug defends the village guard system as essential to Turkey's "fight against terrorism." 3/15 -- BDP leader Selahattin Demirtas meets with Interior Minister Besir Atalay to discuss the safety of Newroz observances. 3/17 -- 14 people are detained in Siirt in another KCK-sweep, including Peace and Democracy Party (BDP) provincial head Sıdık Taş, the Human Rights Association’s (İHD) Siirt branch head, Vetha Aydın, provincial council member Belkıza Epözdemir, Tüm Bel-Sen branch head Ferit Epözdemir, and several administrators from various unions and associations. 3/18 -- Newroz celebrations begin in Hakkari under tight security. Celebrations continued throughout the week with few disturbances, accompanied by the usual Kurdish nationalist fanfare. Celebrations in Istanbul were confined to Kazlicesme in Zeytinburnu. For more in-depth coverage of festivities, including excerpts from message a from Ocalan delivered by BDP members, click here. 3/19 -- Siirt Mayor Sidik Tas is formally arrested. 3/20 -- Prime Minister Erdogan hosts another meeting with Turkish artists. 3/21 -- The PKK leadership's People's Confederation of Kurdistan (KCK) Executive Council Presidency announced a "new phase" in the organization's struggle. Karayılan said in an interview with Ayla Jean Yackley from Reuters News Agency that a political solution has grown increasingly difficult to be reached, pointing to the DTP's closure. "We can end the ceasefire and resume the armed struggle," Karayılan warned. 3/22 -- The Public Prosecutor's Office in Diyarbakır launches cases against Turk and Tugluk for various speeches made by the politicians. Another case against both politicians is being pursued in Ankara. 3/25 -- Demirtas tells Today's Zaman that the BDP will support the government's constitutional package if all restrictions on campaigning in Turkish are lifted (not just the oral use of the language, but also written and broadcast materials), Treasury money is fairly disbursed between parties, and the election threshold is lowered. The following week, BDP co-Chairwoman Gultan Kisanak echoed Demirtas in her party's group meeting, iterating that the BDP's support of the package is conditional on the government's "extensive acceptance" of its recommendations. For more on the BDP's position, including analysis from former Chairman of the Diyarbakir Bar association Sezgin Tanrikulu, see this article from Today's Zaman's Ayse Karabat. Ocalan has said that Kurds should not support the constitutional reform package until the Anti-Terrorism Law (TMK) is lifted. 4/6 -- Prosecutors in Diyarbakir begin to pursue a case against members of the October "peace group." From Today's Zaman: "At the time of the Kandil-Makhmour returnees, Prime Minister Recep Tayyip Erdoğan was critical of the jubilatory nature of the group’s reception and had said: “Is the attitude seen at Habur correct? Is it a unifying attitude? Is it an attitude that makes people uneasy? Is there freedom and peace in the attitude?”' See also this report from Bianet. 4/8 -- Former MP of the closed Democracy Party (DP) Leyla Zana is sentenced to three years' imprisonment under charges of "propaganda for a terror organization" on the grounds of calling PKK leader Öcalan the "Leader of the Kurdish People". See also coverage from Today's Zaman. 4/12 -- A man attacks Ahmet Turk outside the Bilen trial in Samsun. Turk is hospitalized, and questions emerge about the security with which the former DTP leader was provided. Protests and highly questionable clashes with police breakout throughout the country (see also reportage from Bianet). Shops are closed in Hakkari, Yüksekova, Şemdinli, Van, Başkale and some areas of Mersin in protest of the attack. Emerging from the hospital, Turk urges calm. From Today's Zaman: Later, Interior Minister Besir Atalay, "speaking to a TV program, said Turk is known for being courteous and moderate and urged people to remain calm in the wake of his attack and look to his example as a model of a reasoned and measured response to injustice. He added that they will not tolerate attempts at provocation, and he cautioned security forces to take better measures to prevent such attacks in the future." For reactions from the Turkish press, click here. 4/13 -- Demirtas gives a sharply critical speech at his party's group at a podium blazoned with a banner reading "1,483 BDP members still detained." At the meeting, Demirtas declares, "we have seen nothing else but cruelty from AKP during the past eight years. Not one single area of freedom created by AKP was for the benefit of the people". Bianet gives a summary of the "KCK operations," which commenced in April 2009 following DTP victories in the southeast. 4/15 -- Hurriyet columnist Yılmaz Ozdil writes, "The person who punched Ahmet Türk on his nose was an interpreter of the feelings of many people in this country." Lawyers from the Diyarbakir Bar Association file a lawsuit against Ozdil for "inciting hatred and hostility amongst the public and humiliation of the public." 4/19 -- A gymnastics teacher attacks Energy Minister Taner Yildiz in Kayseri, yelling, " “This is the fist of the Turkish people. Here is [a Kurdish] initiative.” Yildiz was attending the funeral of a soldier killed in a PKK attack. 5/7 -- Two more Turkish soldiers were killed in two separate incidents of PKK-placed landmine explosions in Hakkari and Sirnak provinces. 5/8 -- BDP Istanbul Provincial Chairman Mustafa Avci describeds the KCK operations as "political genocide," characterizing them as retaliation won for the electoral victories the DTP won in March 2009's local elections. 5/9 -- For Mother's Day, the southeastern NGO Peace Mothers staged a sit-in in Ankara. More than 100 protestors called for an end to the Turkish military's operations against the PKK. 5/11 -- Riots between students at Dokuz Eylul University in Mugla result in a police officer shooting a Kurdish student. The riots are later said to have had an ethnic dimension. 5/13 -- Former DTP leader Aysel Tugluk is acquitted in two of the multiple cases that have been brought against her since her parliamentary immunity was removed following DTP's closure. 5/16 -- Milliyet runs a statement by Ocalan, issued through his lawyers, that he will no play an active role in settling the conflict if officials do not meet with him by May 31. He warns of attacks and broad rebellions in Turkish cities. 5/16 -- To protest continued operations against the PKK, a group of BDP deputies and a large crowd form a human shield in an effort to block military operations in Lice (Diyarbakir). 5/17 -- The BDP announces that it will begin taking the cases of those arrested in the KCK operations to the European Court of Human Rights. 5/20 - 5/24 -- An additional 120 people alleged to members of the KCK are detained. 5/20 -- The Turkish military carries out air strikes against PKK positions inside northern Iraq. The military later reports it killed 19 PKK fighters. 5/21 -- Six people are arrested for insighting the attack on Ahmet Turk in Samsun. Proescutors are demanding four years for Turk's attacker. Manouchehr Zonoozi, a former director of Roj-TV in Denmark, recently gave an interview to a Danish newspaper in which he spoke of the close links between Roj-TV and the PKK. 5/26 -- The Turkish military reports to have killed four PKK fighters in clashes in Tunceli. Early the next morning, one Turkish soldier and four others are wounded in continued clashes. 5/27 -- A PKK attack in Siirt on a military vehicle kills one Turkish gendarme. 5/31 -- A PKK attack on a naval base in Iskenderun (Hatay) leaves six Turkish soldiers dead. It was the first attack on a Turkish naval base in the history of the Turkish Republic, and a sign that the PKK is intent on expanding the conflict. Some government officials, opposition leaders, and public opinion leaders begin speculating that the attack is linked to Israel's raid on the Mavi Marmara. 6/1 -- An additional six people are arrested in Van in the course of the KCK operations. Seven more people are arrested there on Friday (6/4). Three Turkish soldiers are injured in an attack in Cukurca (Hakkari). Six PKK members surrender at the Habur Gate in Silopi province, and another in Adiyaman province. 6/2 -- A security summit is held in response to increased violence in the southeast. The professionalization of the military is discussed, as well as increasing the response to unrest in the southeast. Interior Minister Besir Atalay expressed the government's commitment to the political and economic solutions laid out in the announcement of the Kurdish opening last summer, but again, failed to give any specifics. 6/3 -- KRG President Massoud Barzani meets with Foreign Minister Ahmet Davutoglu. The two discuss trade between the KRG and Turkey, as well as the deteriorating security situation in the southeast. Barzani reiterates his opposition to the PKK's decision to end the ceasefire, and meets with DP leaders following his meeting with Davutoglu. Violence continues in Cukurca with an attack on an armed police vehicle that injures three Turkish police officers. The local police department and police housing facilities fell under attack the night before. Another two police officers are injured in another attack on Friday. 6/7 -- An indictment is finally issued for the over 1,500 people who have been detained in the ongoing KCK operations. The indictment includes 15 BDP-elected Kurdish mayors. 6/8 -- A bombing in Istanbul's Kucucekmece district injures 15 military officers and two civilian bystanders. Five suspects are arrested after the bombing. 6/9 -- Ten people are arrested in KCK operations in Hakkari, including Hakkari BDP provincial head Sıddık Akış, BDP deputy co-chairperson Berivan Akboğa, former provincial head of the now-defunct Democratic Society Party (DTP) Huvzullah Kansu, Dicle News Agency reporter Hamdiye Çiftçi and party members Baki Özboğanlu and İzzet Belge. Protests in Hakkari's city center following the arrests draw clashes with police. 6/11 -- A bomb placed beside a road linking Tunceli and Elzig injures 13 Turkish soldiers, some of whom were conscripts who had just been discharged after completing their mandatory military service. Police report to have foiled an attempted bombing in Izmir. 6/15 -- At the AKP's parliametary group meeting, Prime Minister Erdogan denounces the BDP, accusing the party of supporting the PKK: "Saying peace won’t bring peace. Those who are in direct or indirect contact with the PKK are accomplices to murder." Erdogan's remarks draw a strong response from BDP leader Selahattin Demirtas, who accuses the prime minister for essentially calling for the closing of the BDP. A PKK-planted landmine in Sirnak kills one Turkish soldier and injures another three. 6/16 -- A PKK attack on a military border post in Sirnak kills one Turkish soldier. The Turkish military responds by sending three commando divisions and a specialized battalion to chase the attackers into northern Iraq. 6/17 -- Ten members of the group of eight PKK memers and 26 residents of the Makhmour refugee camp who crossed at Habur in October are arrested at the first trial against them.